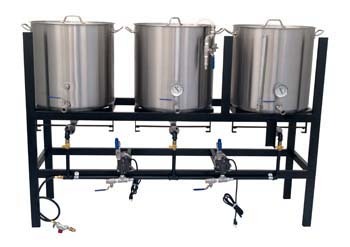 If you want to build a RIMS or HERMS system of your own, More Beer (a BeerSmith sponsor) has a wide selection of pumps, kettles, and brewing sculptures to help you assemble your ideal system. Thank you for joining us on the BeerSmith home brewing blog. Please sign up for my newsletter to get weekly articles on home brewing delivered to your inbox, or give our podcast a listen using the podcast link above. I am also interested in knowing if beersmith can work with a Herms setup. Yes – many people use an infusion step for the first step with HERMS and then use temperature steps in the mash after that. I have BeerSmith and am also a RIMS / BIAB brewer. Is there a Beersmith mash profile for a RIMS Systems? You should be able to use the temperature mash profiles with a RIMS setup. Right now, I have a direct-fire recirculating rig and I use the temperature mash profiles. I plan to move to a RIMS tube setup in the near future and plan to use the same temp mash profiles when I do. I recently purchased a Blinchmann 10 gal Breweasy RIMS set-up and am a Beersmith software user. Are there any plans for updating the software to create equipment and mash profiles for this type of set-up? If not, what advice can you give regarding establishing the correct equipment and mash profiles? Since the inception of these two mash heating techniques, there has been a great discussion as to which is better.. As you know, with direct fire there is always the problem of scorching the wort and grain and steam heating is beyond most home brewers. When I built my 1bbl system I decided not to fool around and build one and then go back and redesign to add the other. So I incorporated both the HERMS and RIMS ideas to operate as one. And so far it seems to work very well. The only other alternative would be to go to a steam fired system, but for a 1bbl system that seems to be a bit to much…. I have been brewing with my direct fire RIM System for many years and have not scorched a batch yet. Lucky? Maybe but my 10 inch banjo burner is 6 inch below the stainless mash tun with a shroud to within 2 inch. Ninetynine percent of my batches are step mashed with continuous recirculation. However I never rush a batch. I always take my time because I still enjoy brewing.